Hernias and surgical repair with mesh implants: What should you know? A hernia is an abnormal protrusion of an organ or tissue through a weak area in the muscle or other tissue that normally holds it in place. Although a hernia most commonly associated with women is the inguinal variety, the femoral hernia is more commonly seen in females – nearest to the groin, located between the abdomen and upper thigh adjacent to the femoral vein. Hernias are caused by a combination of muscle weakness and straining activities. Any condition that increases the pressure in the abdominal cavity can cause a hernia – so straining with lifting, coughing, bowel movements (constipation) or passing urine can lead to both hernia formation and progression. In some situations they can lead to the catastrophic unwanted cases of obstruction (where the hernia is blocked) and strangulation (where the blood supply to the hernia is cut off). 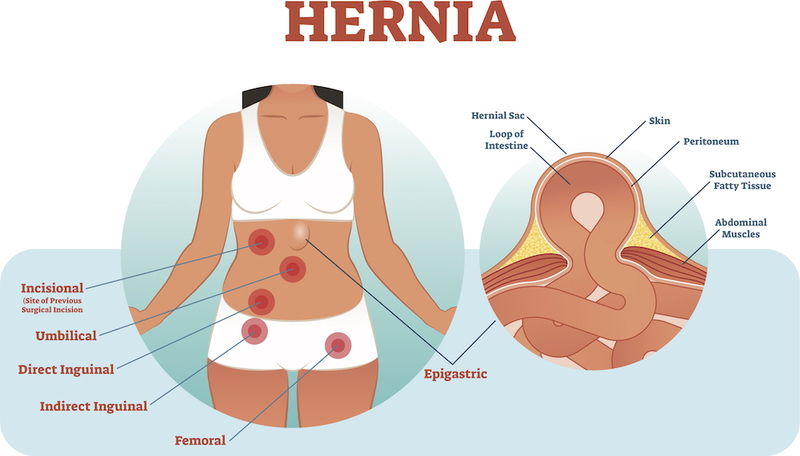 Who is at risk of developing a hernia? There are around 70,000 hernia repair operations each year in the UK, which makes it one of the most common surgeries performed across the country. The use of mesh implants involves pushing bulging tissue back into the body and covering it with the mesh material; it can be delivered via open or keyhole surgery. Using mesh, particularly for hernia repair, is an established practice and we know there are reduced risks of recurrence when it is used. Clearly, if a hernia comes back, it will affect the quality of life of the patient and potentially mean requiring further surgery. However, there is also a greater understanding that mesh repair can lead to chronic pain in the groin. This is due to the presence of the mesh, nerve injury, scar formation or any combination of these factors. Chronic pain can occur in 20% of surgeries and can affect the patient’s quality of life. Therefore explaining this is vital so patients know that they may need to expect this. A vaginal mesh (currently being mentioned in the press) is a net-like implant used to treat incontinence or prolapse, conditions that have often, but not always, been caused by childbirth. 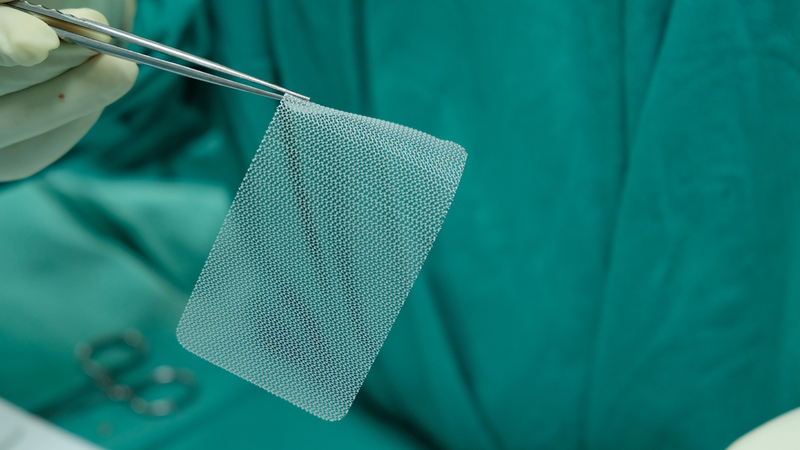 However, the mesh material used is the same ‘recommended’ mesh to repair hernias, which has been said to have left patients undergoing the vaginal mesh in agonising pain. In over 20 years’ experience of operating on hernias, using various mesh materials and understanding their response to the body, I believe that there is a tendency that patients are not always fully informed of the risks and benefits of mesh repairs when deciding on surgery. As many as 800 women in the UK are said to be taken legal action against the NHS over the use of vaginal ‘mesh’ implants. It is important you are aware of the various options available and the expected outcomes for hernia repair. What can alternative materials be used for a hernia mesh repair? Hernias are usually repaired with plastic-like synthetic meshes (polypropylene). These come in various shapes and sizes depending on the type and size of a hernia to be repaired. Some meshes are repaired using biological materials. These are expensive and therefore used in very specific settings such as where there may have been an infection. Some hernias can be simply repaired with stitches and therefore it is important to discuss these options with your surgeon. What could be the contributing factors towards these women suffering agonising pain because of the vaginal mesh repair? It is important to not confuse the vaginal mesh repairs with hernia repairs. However, it could well be that the factors that lead to chronic pain are the presence of the mesh, nerve injury and the development of scar tissue or a combination of any of these factors – similar to a hernia repair. Can a hernia heal by itself? No, it cannot. I cannot advise rest, physiotherapy or any medication. The underlying problem is an opening that needs to be closed using stitches and/or mesh. The alternative to surgery in unfit patients or where the hernia opening is large is the use of a truss or some form of surgical groin support. Are there any other new innovations in terms of mesh material that patients should be aware of? Hernia meshes are continuously evolving so that they are lightweight and better contoured to the shape of the patient to reduce the chances of the patient being aware of the mesh after surgery. There are also now meshes that can be placed without stitches (Progrip). However, you will need to consult your specialist to see what is most appropriate for you. How likely is it that a patient will suffer recurring hernias? The likelihood is 1% for groin hernias but this may be higher in other types of a hernia such as incisional hernias (where surgery has been undertaken before). Therefore, it is vital you consult a specialist to understand your type of a hernia and its chances of recurrence following its repair. How long does it take to recover from a hernia surgery generally? With laparoscopic hernia repair (keyhole surgery), you will probably be able to get back to your normal activities within a short amount of time. These activities include showering, driving, walking up stairs, lifting, and work. Heavy levels of lifting will be possible from 6 weeks.